Paper-based data collection has been around as long as humans have had an interest in understanding the world around them — tick marks on parchment were used by ancient civilizations to track food inventory, and in the 1800s the first known census was collected via pen and paper. Now, digital and cloud-based systems for data collection are rapidly increasing, but despite this trend, a surprisingly large number of organizations still opt for paper-based data collection. Why is this? There are many reasons why companies believe this method is still better. In this article, we will look at three of the biggest myths and analyze why they may not be as true as some organizations believe. A World Bank study found that average interview costs decrease by up to 71% when using mobile data collection. Similarly, according to a study conducted by the National Center for Biotechnology Information, paper-based studies have the potential to be 49-62% more expensive than digital methods used over the same period of time. That could work out to be a lot of money! Once they transitioned to digital data collection, this month-long process completely went away. Digital methods eliminate a substantial amount of human error and therefore are more cost effective than paper methods, despite the higher initial costs and monthly fees. 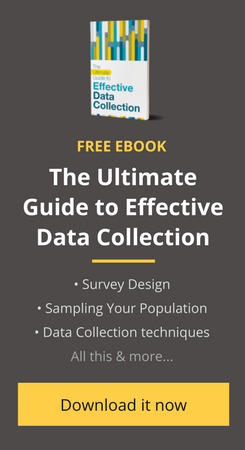 Read more about how to save more with digital data collection here. It is true that it takes time to train staff on new digital collection systems. But that doesn’t mean it isn’t worth the time; and it’s not as much of a time investment or challenge as companies might think. Contrary to popular belief, digital systems require minimal training since today they are becoming more and more user-friendly. Researchers from the University of Ireland discovered that training time actually “reduced substantially” when they switched from paper-based surveys to digital data collection, since training no longer had to cover data coding. Digital data collection also saves training time because survey apps automatically handle complex skip patterns, which take a long time for surveyors to learn and master on paper. A World Bank study found that 89% of surveyors actually prefer mobile data collection tools over paper-based surveys. Combine this with the fact that digital methods are proven to be less expensive in the long run and will decrease entry errors across a data set, and there is little reason to not invest in a digital data-collection system. Save up to 70% time and 71% money by switching to mobile data collection platforms for your projects. Start your free trial of Collect today! Since its inception, a common concern about the cloud is that it is less secure than paper. While this is a valid concern given successful hacking attempts in recent years, cloud data is actually far more secure than many companies think, and paper data can be highly insecure. There are also more people involved in seeing the data: the enumerator, data-entry clerks, consultants and headquarters staff at a minimum. Data housed on paper often ends up sitting in unmonitored filing cabinets or on someone’s desk – places that are far from secure. Digital collection systems, on the other hand, often come with some form of security and/or encryption (here’s a detailed example) that keeps digitally collected data safer than it would be in any other form. There are still organizations that will argue for paper-based data collection, citing unnecessary expenses, long training times and minimal data security. A deeper look at these arguments, though, shows that paper-based data collection, while valuable at one time in our history, is no longer the ideal method for data collection, especially now that there are high-quality digital data collection platforms to help move every organization into the digital data collection age. Kayla Ferguson is an avid world traveler who writes and does creative stuff to fund her globe-trotting addiction. She can also frequently be found running the mountain trails of Colorado, scuba diving or trying to brainstorm the next world-saving idea with her two best friends--sorry, cats.